Let us not make any bones about this, X-Factor has reached its endgame. Peter David is wrapping up this book as he has reached the end of his series, and what a book it has been. Ten years worth of X-Factor and it has been excellent with the ever loveable Madrox. The cover represents the fact that the characters David has taken on, have become his own and he is now deciding their fate. They do not appear in other books and sentimentality only lies with the X-factor reader, hence the reason a sprawled dead Monet is on the front page. Its pretty shocking as she lays there in a crucifixion posture, with her hair sprawled out and a distant faraway look in her eyes. Its devastatingly sad because Monet has gathered love over the years and her tough personality is laid bare. In her blood we see etchings of her teammates in a lovely but upsetting spiral pattern. Eyes are wide open and mouths are aghast in shock and we can only assume the worst. Its a beautiful effect and fitting of the finale of the arc and we may be ready to say goodbye to Rahne, Layla, Lorna, Shatterstar, Longshot and Rictor. 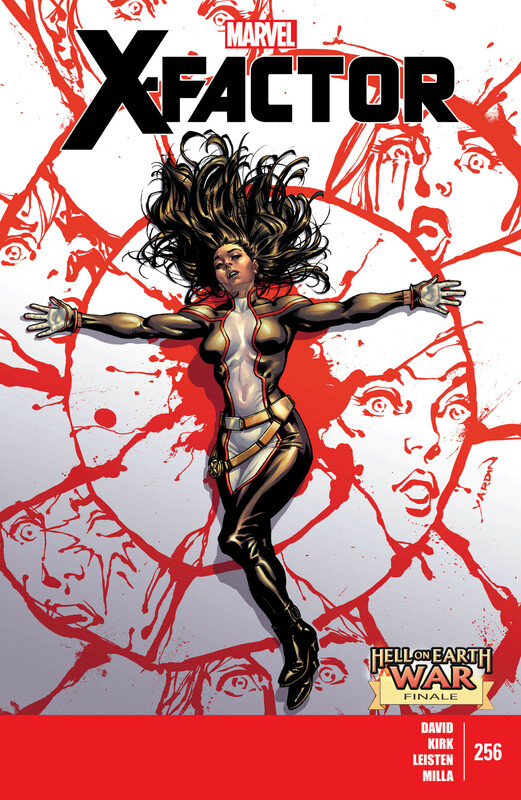 I will be sad to see Layla move on especially since we have been watching her know stuff since House of M. I thank thee Peter David and I really hope that the book ends on a happier note than the once displayed through the blood of Monet.